Sportovní výfuk Turbo se svody Ø 38 mm (černý lak) + montážní set. 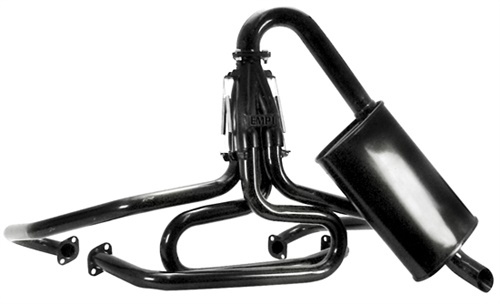 Black racing exhaust Ø 38 mm with Turbo muffler (1-1/2"). Use this Extreme™ Off Road exhaust designed for maximum power and minimum problems. Spring attachment system couples merged collector to individual port pipes in a manner designed to absorb vibration and thereby eliminate breakage commonly found during those brutal off-road races. Available in three tubing sizes. We offer a variety of options and accessories for our racing exhausts. The new Extreme™ Muffler Kit allows you to run your current Extreme™ Exhaust with a quiet Turbo muffler, but keep your stinger for competition. We also offer various collectors only so you can convert or customize your existing Extreme™ Exhaust system.